Come and visit our digital screen at the Southwater ground floor - there are over 500 images brought together as a digital archive with important milestones in Telford’s development. 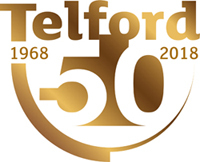 Telford was established as a new town. Family skiing on The Wrekin during Winter 1969. Telford teenagers enjoying Carnival in Oakengates. Telford United won FA Challenge Trophy, beating Hillingdon 3-2. Duke of Edinburgh opens Madeley Court School and Recreation Centre. Aerial view of the newly developed Woodside Housing Estate. Miners working on the coal face at Granville Colliery. Staff working on the great British brand Ever Ready production line formerly located on Hinkshay Road near Telford Town Park. Telford Shopping Centre Fashion showcases the latest trends in 1970’s fashion. Prime Minister James Callaghan visits Telford to open the Silkin Way. Teenage residents of Sutton Hill in Summer 78. Super Saturday Camel racing in Telford Town. HRH Queen Elizabeth II visits Telford Shopping centre. The famous Coracle maker Eustace Rogers in Ironbridge Gorge in 1982. Telford motorway link / M54 opens. HRH Princess Anne opens Telford Ice Rink. Telford Speedway is hosted at Telford Ice Rink. Telford Central station opens / The Ironbridge Gorge is awarded World Heritage status by UNESCO. HRH Prince Charles visits Ironbridge. Princess Diana the Princess of Wales visits Thomas Parker School. Telford United win FA Trophy against Macclesfield, 1-0. The Princess Royal Hospital opens. Thomas Telford school was established.